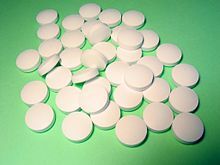 In the tablet pressing process, the appropriate amount of active ingredient must be in each tablet. Hence, all the ingredients should be well-mixed. If a sufficiently homogenous mix of the components cannot be obtained with simple blending processes, the ingredients must be granulated prior to compression to assure an even distribution of the active compound in the final tablet. Two basic techniques are used to granulate powders for compression into a tablet: wet granulation and dry granulation. Powders that can be mixed well do not require granulation and can be compressed into tablets through direct compression. ^ a b c d e Mestel, Rosie (2002-03-25). "The Colorful History of Pills Can Fill Many a Tablet". latimes. Archived from the original on 2015-09-19. ^ "Inventor of the Compressed Tablet: William Brockedon". The Chemist and Druggist. August 1954. Archived from the original on 2016-05-14. 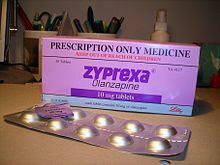 ^ "World's oldest pills treated sore eyes". New Scientist. 7 January 2013. Archived from the original on 22 January 2013. Retrieved 5 February 2013. ^ Giachi, G.; Pallecchi, P.; Romualdi, A.; Ribechini, E.; Lucejko, J. J.; Colombini, M. P.; Mariotti Lippi, M. (7 January 2013). "Ingredients of a 2,000-y-old medicine revealed by chemical, mineralogical, and botanical investigations". PNAS. 110 (4): 1193–1196. Bibcode:2013PNAS..110.1193G. doi:10.1073/pnas.1216776110. PMC 3557061. PMID 23297212. ^ Anderson, Leigh (2014-02-24). "Pill Splitting - A Safe Way to Save Healthcare Dollars?". Drugs.com. Archived from the original on 2016-05-01. Retrieved 2016-04-29. Many pills that can be safely split have a “score”, a line down the middle of the pill, that allows for easier splitting. ^ Safire, William (1986-03-09). "On Language; The Caplet Solution". The New York Times. Archived from the original on 2017-12-13. Retrieved 2017-12-06. ^ Cottrell, J.; Koenig, K.; Perfekt, R.; Hofmann, R.; For the Loperamide–Simethicone Acute Diarrhoea Study Team (2015). "Comparison of Two Forms of Loperamide–Simeticone and a Probiotic Yeast (Saccharomyces boulardii) in the Treatment of Acute Diarrhoea in Adults: A Randomised Non-Inferiority Clinical Trial" (PDF). Drugs in R&D. 15 (4): 363–373. doi:10.1007/s40268-015-0111-y. PMC 4662947. PMID 26541878. ^ "Compressed Sugar Coated Caplet Dosage Form (Code C69002)". NCI Thesaurus. Retrieved 2017-12-06. ^ "Extrusion Speheronisation". PharmaCMC.com. Archived from the original on 1 October 2016. Retrieved 26 September 2016. ^ "Articles :: ГК "Аптека-95"". Archived from the original on 2014-01-27.